How Could Anyone Not Want A 560-HP Mercedes-AMG G63? Too bad it costs six-figures. In the not too distant future, Mercedes-Benz will be launching an all-new G-Class SUV. We know it’ll retain the overall look of the iconic original, but there will be changes in order to update it. Question is, will it still carry that go anywhere, do anything image? We’ll find out soon enough, but today is not that day. No, today we bring you the 2016 Mercedes-AMG G63, all 563 hp of it. We’ve already reviewed the so-called G-Class base model, the G550, and the AMG G65 is pretty hard to locate. 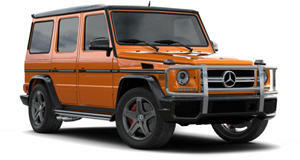 But for us, the AMG G63 is more than good enough. That horsepower comes from a 5.5-liter twin-turbo V8 with 560 lb-ft of torque, with power being sent to all four wheels through a seven-speed automatic. What you need to know about the G-Class is that, unlike so many other "SUVs" today, this one features solid axles front and rear, and a body on frame chassis, as opposed to unibody. That means the ride may not be the smoothest, but, honestly, who cares? Mercedes has managed to blend off-road prowess with luxury all wrapped up in a military-esque look. That makes complete sense considering the G-Class was originally developed as a military vehicle. But times are changing and Mercedes has ultimately realized the G-Class, which has been around in civilian form since 1979, needs to modernize. But for now, here’s to the original, and one that’s been treated by the talent in Affalterbach. Special thanks to Mercedes-Benz of Walnut Creek for letting us film the car.